When it comes to your business printing needs, we've got you covered. We can provide virtually any printing product you need to communicate your ideas, designs, reports, and marketing products. All products will be customized to meet your specific needs. But that's only the beginning. To learn more about the many products and services we offer, please contact one of our representatives by calling us at (907) 563-1989. Even when we close our doors and go home at night, we're still just a point and click away. Our Customer Service Center provides clients with 24-hour access to our services. From here you can request an estimate, place an order or transfer a file, all from the convenience of your office or home. We want to make the process of doing business with us as easy as possible. Feel free to explore our site. You can view our Detailed Services, Send Files or Request An Estimate. Just email us day or night! Don't see your product here? This is just a sampling of our most popular products. If you have a project you would like to print but don't see it listed here, contact us and we'll work with you to see if we're a good fit for your project. We can take care of all of your Annual Report printing needs, from the Annual Report itself to the Proxy Statement and other documents. We can even prepare your documents for mailing. Our variable data capabilities ensure your documents get to the right people on time, every time. Our banners are printed on sturdy vinyl material to withstand the outdoors. We can print them up to 64" wide and up to 100 feet long! Looking for a retractable banner? We print those as well. Submit an Estimate Request with the size you need for pricing details. We now offer blueprint printing! Send us your digital plot files and get high-quality blueprints at a competitive price. Request an Estimate or call us today for pricing details. Whether it's a program, directory, or coloring book, we can produce high-quality booklets of almost any size and in a variety of stocks. Whether you need them saddle stitched or spiral bound, with anything from laminated covers to self-cover, we'll ensure a product you can be proud of. We can print and fold your brochures or flyers on a variety of stocks to suit your needs. Need them prepped for mailing? We can take care of that too. Contact us for more details. We can print business cards that range in format from basic black and white to full color with UV coating. We offer one or two-sided printing, thermography (raised ink), embossing, foiling, spot UV, full UV or even plastic cards to make your business card stand out from the rest. Contact us for more details. Make a good impression every day of the year with our vibrant color printing and glossy finish. Call or Request an Estimate for details. Advertise everywhere you go with our custom car wraps and decals. All we need is the make and model of your vehicle or the size of the decal you would like and we can provide you with an estimate. From 2-part to 4-part NCR, we can print black ink or full-color carbonless forms in almost any size up to 11"x17". Whether you need numbered or pre-perfed forms, continuous forms, or books with wraparound covers, we can create a product to fit your needs. Minimum order on NCR forms is 250. We offer envelopes in all sizes, and can print in basic black ink or full color to match your other company materials. We can print regular, window, or security envelopes. Contact us today for pricing. Whether you need basic black and white labels or full-color die cut labels, we can meet your needs. Our wide format machine can print sturdy vinyl full color labels, or we can create roll labels on our label press. Our roll labels can be up to 3 colors and can be die cut to almost any shape. They can be printed on white litho, gloss, or gold or silver stocks. Contact us today for more details or an estimate. We can print letterhead on a variety of stocks to suit your needs, and can print anything from basic black and white to full color designs. We can also create a corporate identity package for you to include letterhead, envelopes, and business cards. Request an Estimate or call us for more details. Minimum order for letterhead is 500. Effortlessly turn your vehicle into a mini-billboard with magnetic signs that come off as easily as they are put on. Or hand out business card size magnets to your customers to keep you top of mind. Contact us for an estimate. When you choose us for your newsletter printing, you can distribute vibrant, full-color newsletters on a variety of stocks from smooth to glossy. Bring us your mailing list and we'll even take care of the mailing process as well. Contact us today for an estimate. We can create notepads in a variety of sizes with your company logo and information. Contact us today for an estimate. We can print full-color posters of practically any size. 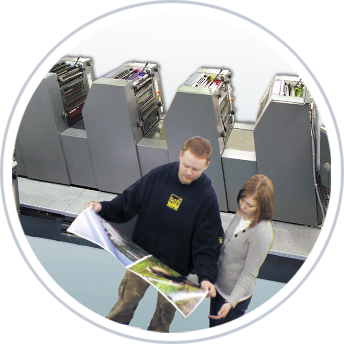 With the capability to run single posters or large runs, we can meet virtually any need. Contact us for an estimate today. We can create impressive full-color programs to commemorate your special event, from banquets and ceremonies to large performances. Contact us for more details or an estimate. We partner with BIC to provide you with all your promotional items needs. Whether you need sticky pads or pens or mugs, we can help meet your needs. Contact us today for estimates or to view our catalog. We can print your magazine or publication in many different sizes and formats. 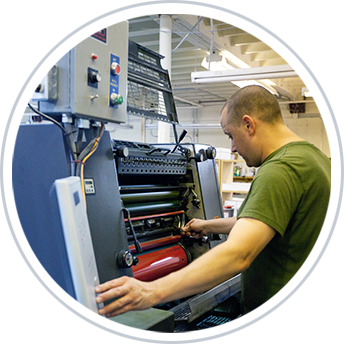 Some options include self-cover or separate cover, saddle stitching or coil binding, and digital or offset printing. Minimum order amounts or other considerations may apply to some options. Contact us today for an estimate or for more information. We offer a variety of sign options, from realtor signs mounted on plastic corrugated board that withstand outdoor use, to indoor signs mounted on foam core. Our mounted signs can be small counter top signs or large signs up to 5 feet by 10 feet. Looking for a stand-up retractable banner? We can print those as well. Contact us for more details or a price estimate. We can print and install your window lettering or other graphics and help you stand out from the crowd. Our vinyl lettering and decals are durable and fade resistant to ensure they last.